Vintage - Japanese Wisteria Garden Pattern Tea Set, 21-Piece Service for Six, Circa 1940's. This is an absolutely beautiful Tea Service for Six. Pieces are Cream Colored with Large Yellow Flowering Wisteria and a Pagoda or Church in the Background. The Set seems to be Bone China, but cannot be certain. 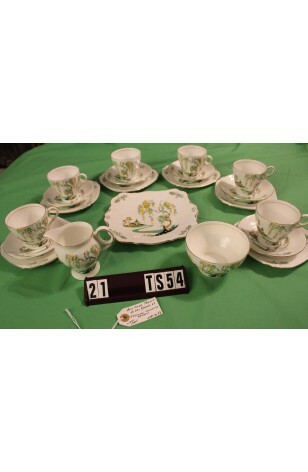 Tea Plates and Cookie Platter are Square with Handles on Platter. Lots of 22kt Gold Trim adorns Rims, Handles and Inner Ring of Cups. Great Condition. This is an absolutely beautiful Tea Service for Six. Pieces are Cream Colored with Large Yellow Flowering Wisteria and a Pagoda or Church in the Background. The Set seems to be Bone China, but cannot be certain. Tea Plates and Cookie Platter are Square with Handles on Platter. Lots of 22kt Gold Trim adorns Rims, Handles and Inner Ring of Cups. Great Resale Condition unless noted below or in pictures.